The staggered teeth are alternated on the left and right while the straight teeth are uniform on both sides. This prepares the cutters for different applications. The purpose of alternating is to provide additional chip space. This is important when you want to achieve deep slotting. We use top quality raw material and our products are known for their excellent performance and optimum quality.. The process of grinding is highly technical. It requires that they are ground with slight concavity and clearance. This will ensure that neither side will drag when you make the cut. This is necessary to produce predictable results. 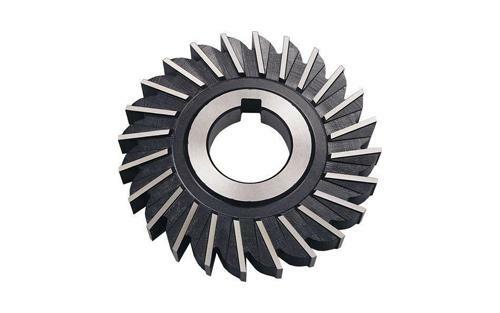 The radial rake and axial designs enhance the performance of the staggered cutter making it a free cutting tool. This also enhances chip disposal for the cutter. Some cutters follow the long side tooth design which offers larger latitude. This makes modification easier and enhances regrinds. It makes regashing more economical. The availability of raised lands will allow you to re-sharpen on numerous occasions while at the same time avoid clearance grind. Style S cutters are made to interlock regardless of the dimension of their diameter. Staggered cutters offer an incredible range of options depending on application. They allow you to select from a pool of .170 to 1.250 in metric sizes. The ability to interlock allows you to gang several cutters in order to be economical during production. Standardization when selecting your cutters is necessary because it reduces down time during production, brings down your inventory, eliminates long deliveries and ultimately brings down production cost. Straight teeth cutters provide uniform results and are the best when you require a smooth finish. They can be used on delicate surfaces because their cut is straightforward. They are mainly not built to interlock. The profile-ground cutters are sharpened using the appropriate clearance on the sides and outer periphery. This process will either change or maintain the angle depending on how it is carried out. Sharpening has an incredible influence on the efficiency of your cutter. These cutters require regular sharpening and are easy to salvage after continued use. Form-Relieved Cutters are used in intricate milling situations. Such situations include areas with blending radius and angles, gear tooth forms and spline. The design prevents the form from changing after continued grinding. This is an advantage during production since the first and last pieces will be identical. They can either be sharpened manually or using automated tools. Maxwell technicians will deliver customized dimensions and advise on the best material to use depending on your target application. Choice of the right raw material guarantees consistency, efficiency and long life. The widths and diameters vary depending on application. The choice of straight or staggered teeth should be made in consultation with your tool engineer. Maxwell tools will give you an excellent milling and cutting experience.